Richard Archbold and Donald Roebling were boyhood school friends and descendants of two "first families" of American business: John Dustin Archbold was President of Standard Oil of New Jersey, and John August Roebling, the famed designing engineer of the Brooklyn Bridge. In 1941, their friendship resulted in the donation of 1,058 acres of pristine south central Florida land from the Roebling family to famed aviator, world explorer, and research associate with the American Museum of Natural History--Richard Archbold. Richard established the Station and his prescient vision, hard work, and exemplary generosity set the standard of excellence that thrives today. After Richard's death, his sister, Frances Archbold Hufty, carried the torch forward for 27 years. Under her steady, passionate leadership, education and conservation flourished. This proud tradition of American family philanthropy has echoed through the generations. The Archbold family and friends have loyally safeguarded Richard's vision and fostered the growth of what has become an international model for research, conservation, and education. Richard Archbold was born in 1907 in New York City. Heir to early fortunes of the Standard Oil Company, Archbold became an internationally renowned aviator and explorer. During 1929-1939, in affiliation with the American Museum of Natural History, he organized, supported, and led four biological expeditions, first to Madagascar and then three to interior New Guinea. These expeditions are still famous for their comprehensiveness and significance to science. They included the discovery of a major human civilization in the New Guinea highlands, previously unknown to the outside world. In 1941, he moved to Lake Placid to fulfill a dream. He established a permanent biological research station on a 1,000-acre preserve, where scientists could live, explore, and conduct research on animals and plants in their native settings. Following World War II, Archbold continued to support biological explorations in New Guinea and Australia, but he remained in Lake Placid the rest of his life. Living at the Station, he became an active member of the Lake Placid community, assisting countless service organizations. He helped bring electricity to the rural regions of Highlands County. He worked constantly at improving the Station's facilities, collections, and library, and personally supported the research and living costs of every scientific visitor. In 1973, he added 3,000 acres of adjacent native habitat to the Station. Richard Archbold died of cancer on August 1, 1976. He left his estate, Archbold Expeditions, to provide permanent core funding for the unique biological station that bears his name. Lohrer, F.E. (Editor). 1992. Archbold Biological Station, Lake Placid, Florida, Sixth Edition. Archbold Biological Station, Lake Placid. 28 pp. Revised: 26 March 1997 & most recently 13 July 2007 by F.E. Lohrer. 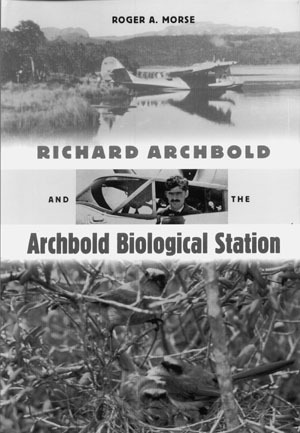 "Richard Archbold and the Archbold Biological Station," a biography by Roger A. Morse published in 2000 by University Press of Florida. 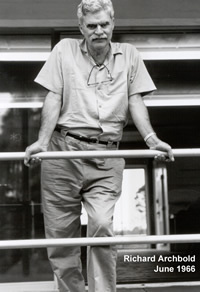 Roger Morse, renowned professor of apiculture at Cornell University’s Department of Entomology, and seven of his graduate students, regularly conducted research on honey bee behavior and biology at Archbold, 1963-1998. After his retirement from Cornell’s faculty, Roger started work on a biography of Richard Archbold, visiting libraries and archives in New York (and especially at the American Museum of Natural History) during the summer, and combing the Station’s rich historical archives during the winter. The book includes a foreword by Archbold’s Executive Director Hilary Swain and a chapter by Richard’s sister and President of Archbold Expeditions, Frances Archbold Hufty. Sadly, Roger Morse died on 12 May 2000 at his home in Ithaca, New York, just a few weeks after the book was published.